Peaceful. Penetrating. Pure. 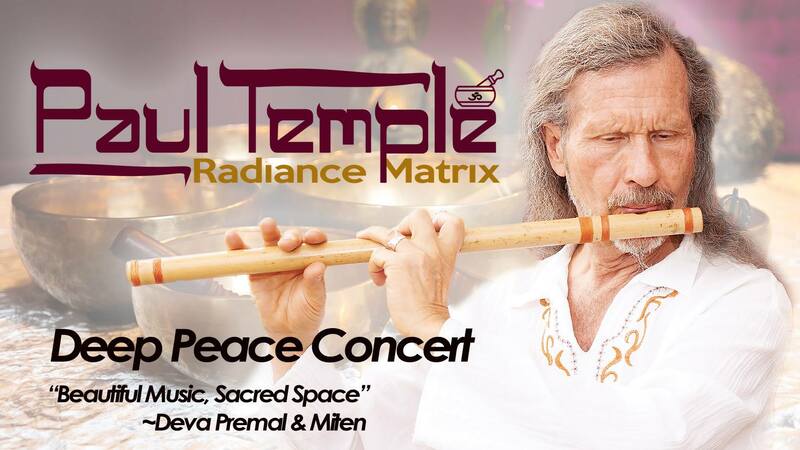 These words have been used to describe the music of Paul Temple’s Radiance Matrix, who has toured internationally, offering Deep Peace Concerts as a path to beauty and inner peace. His album RADIANCE MIXES, featuring the voice of Deva Premal, went to #5 on iTunes World Music chart. You are invited to dissolve into another dimension – the pure land, the timeless Buddha field. Immerse yourself in the warm spaciousness of Tibetan Bowls that calm the nervous system, still the mind and connect us with the sacred sound current. The gathering is a cross between a concert, a meditation and a journey into the mystic. Paul weaves an eclectic musical mix of tuned healing bowls, haunting flutes, Sanskrit mantras, Tibetan throat singing and dream-like songs, dabbed with classical touches of Bach and Debussy. Tibetan Healing bowls are a simple but powerful path to inner peace, which is something difficult to find in our busy technological world.